We all remember our senior year of high school. For some- it may have been unforgettable. However, John Fox of Northampton’s experience may have just topped us all. 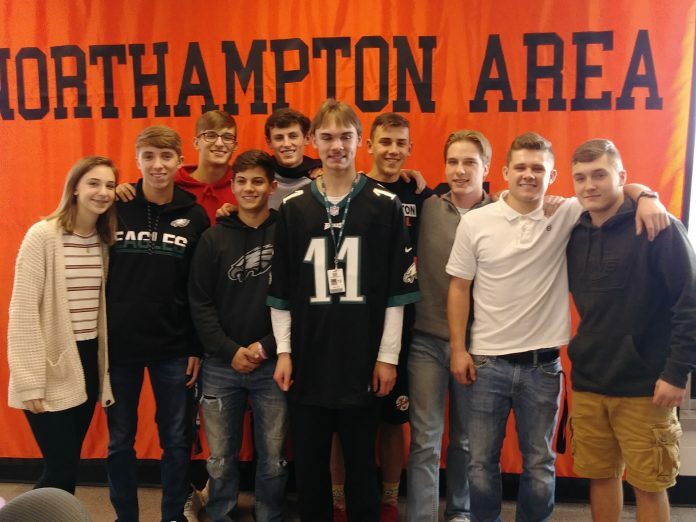 On Tuesday, Nov. 6, Northampton Area High School Senior John Fox celebrated his 18th birthday with some of his close friends. What he didn’t realize was that these nine Northampton High School seniors had a big surprise up their sleeves. Fox has been a Philadelphia Eagle’s fan for most of his life. “He loves the Eagles-he is very passionate about that,” said mom Sherri Ann of Northampton. Longtime friends, Phil Vooz and Max Martinez, know how much football and the Eagle’s specifically mean to Fox. Vooz reached out to John’s mom Sherri and a group of their friends about purchasing two tickets to the Dec. 23 game (Eagles Vs. Texans) for Fox’s birthday. The students took all of the initiative by themselves, making the gift all the more special. Fox was in study hall on Tuesday, Nov. 6, when he was given a pass to go to another classroom. With little details as to why, Fox was confused. However, like the good student he is, he followed what he was instructed to do. Upon entering the classroom, Fox was greeted by some of his good friends with Happy Birthday wishes, before informing him of their idea to buy him the Eagle’s tickets. They were also able to score passes to the sidelines for pre-warm up and the opportunity for Fox to receive any jersey of his choice. Ecstatic Fox couldn’t believe his ears. Sherri explained how surprised he was at the more than generous gift he was presented with. “He never asks for anything,” Sherri mentioned, making Fox the perfect recipient of this gift. Sherri Fox also added that her son wants to be a sports commentator one day. What a better way to kickstart his dream than at Lincoln Financial Field on December 23? Fox will never forget this awesome birthday.